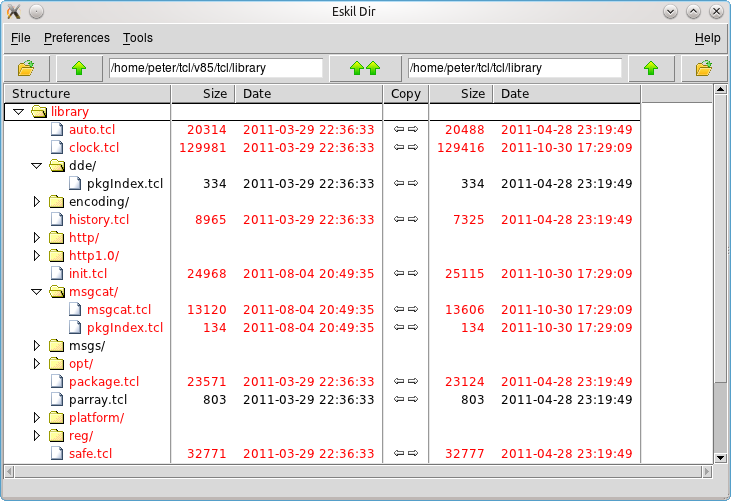 Eskil is a graphical tool to view the differences between files and directories. It supports version management and patch files and has various preprocessing and alignment options to improve the display of tricky diffs. Pronunciation: The E is short, like in "set", the rest is like "skill". Any feedback, good or bad, can be sent to <peter dot spjuth at gmail dot com> or added as a Ticket. It is similar but unrelated to TkDiff. Highlights changes within a line. Matches similar lines within a changed block to better show changed lines that are adjacent to added/removed lines. Conflict merge and three-way merge. Commit changes directly from Eskil. View patch, from file or clipboard. Alignment and block diff functions for tricky diffs. Edit and Save file from diff window. A "zoom" feature for long lines.